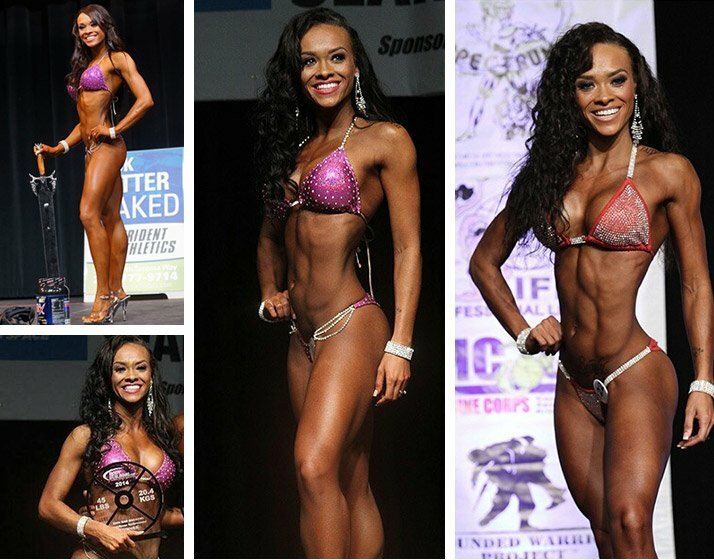 5 Must-Read Tips For First-Time Bikini Competitors! Thinking of stepping on stage for the first time as a bikini competitor? Read these 5 tips first to start off on the right heel! Lots of folks undergo an incredible physique transformation just by participating in a 12-week fitness challenge. If you've done one, you know they can be a strong, motivating force. But don't stop there! Take the next step by directing your energies toward stepping on stage. Consider entering a physique competition—nothing gets you focused like strutting your stuff in front of others. You might be overwhelmed by the new challenges and obstacles your first competition presents, but ultimately you'll find the experience can be extremely rewarding. It's an opportunity to set—and achieve—a major goal in your life, which creates the possibility of a fulfilling journey. If you've never competed, you'll have plenty of questions, and that's where I can help. To get you started on the right heel, here are five things you should consider prior to starting your first contest prep. With these out of the way, you'll have five fewer things to worry about as you actually begin your preparation. Some people might tell you their purpose for competing is to win, but the results are actually out of their hands. There are many uncontrollable factors, like the judges' preferences and other competitors. But narrowing your focus to just you—what you want to accomplish—enables you to win regardless of the show's outcome. Start by identifying your purpose for competing. Are you doing it to lose weight, to build your brand as a trainer, or simply for fun? Give it some thought, then write it down. Competition preparation can sometimes be an emotional rollercoaster. Revisiting your purpose regularly will help you consistently push past some of those low points. Narrowing your focus to just you—what you want to accomplish—enables you to win regardless of the show's outcome. As an amateur, there are a number of organizations you can compete under. Just a few are the INBA, WBFF, and NPC. I recommend researching the leagues, understanding their rules and regulations, determining when and how frequently they offer competitions in your area, and deciding which best fits your goals. I personally started as an amateur in the NPC (National Physique Committee), which is the largest group of the bunch. It may help you decide which organization you want to compete in by attending a show. For that matter, attend a number of different shows held by various organizations. This will help you assess the production value and make an informed decision on the quality of the event. Talk with the promoter and other local competitors about the pros and cons of the organization as well. It pays to stick around after the show to get some insider insights, so don't be afraid to ask questions. On top of that, you'll want to pay particular attention to the actual competition flow—how the show works, what poses you have to strike, how the lighting looks, and more—to better know what you're signing up for. The best way to eliminate as many surprises as possible heading into your first show is to thoroughly understand how an event is staged. High Protein/Quality Calorie Shake To Supplement Healthy Meals And Snacks! Go Now! Being completely new to competing, it can be beneficial to have a coach— as long as you hire the right person. A good coach can guide your preparation from start to finish, but not all coaches are cut from the same cloth. Don't grab the first person who approaches you at the gym, for example. If there's a good local coach in your area, other competitors probably know who he or she is. Again, it pays to ask questions. Research different coaches and make sure their training philosophies are similar to yours before setting up an official appointment. Once you have a meeting lined up, go prepared with a list of questions, and even ask to speak directly with some of their clients. Make sure you are extremely comfortable with the coach before handing over a check. Furthermore, determine if you need your coach to be an in-person coach or if you can work with an online coach. My recommendation is that you hire a veteran coach if you're new to competing. Still, if you believe you can train yourself for a competition, that can be very rewarding as well! Just because there's not much in terms of equipment when competing in physique sports doesn't mean you won't face some substantial costs. It's best to get an idea of what those will be ahead of time. I think a number of first timers badly underestimate or don't pay attention to this until they get hit with sticker shock. These are ballpark figures, and they don't even include precontest foods or supplements! We're just talking about event expenses. Of course, as you continue competing you won't have to repurchase some items, and you might find ways to cut costs, like sharing a hotel room. If you've competed before or are in the process and have incurred other expenses not listed here, please share those in the comments section below. THE NEW BRAND DOSED + FORMULATED SPECIFICALLY FOR WOMEN Go Now!